NBC announced Monday that Conan O'Brien will take over from Jay Leno as host of the "Tonight" show. But he'll have time to write his jokes - the planned succession won't happen until 2009. The announcement solves a delicate problem for NBC, which realized O'Brien was getting antsy in his "Late Night" time slot (12:35 a.m. Eastern) and wanted to keep him from jumping to another network. Leno planned to make the announcement on Monday's edition of "Tonight," a special celebration of the talk show's 50th anniversary. 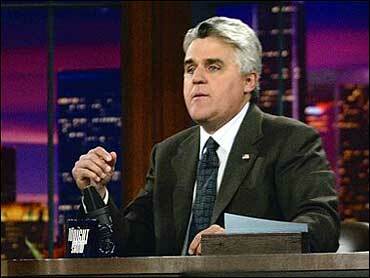 "In 2009, I'll be 59 years old and will have had this dream job for 17 years," Leno said. "When I signed my new contract, I felt that the timing was right to plan for my successor and there is no one more qualified than Conan." "Plus, I promised Mavis I would take her out for dinner before I turned 60," the notoriously workaholic Leno said about his wife. Leno took over from Johnny Carson on "Tonight" in 1992 and after a few years of trailing the man he beat out for the job in the ratings - David Letterman - he passed the CBS star and has been dominant in the time slot. An unknown at the time, O'Brien had the thankless job of taking over from Letterman on "Late Night," and he was nearly fired after several weeks of painful shows. But he recovered and has been a critical and commercial success. But O'Brien has openly talked about wanting to move on and, in the late-night world, that means an earlier time slot.